Weighted blankets for kids have been exploding in popularity recently, as an aid to calm anxious children and also help kids get better sleep. If you’re a parent, you’ll know one of the biggest challenges we often face is helping our children get the quality sleep they need. Kids need more sleep than adults and they need quality sleep to grow to their full potential. The problem is – in a world of stimulating technology and constant demands on our attention, combined with rising rates of autism and ADHD, this isn’t always an easy task. 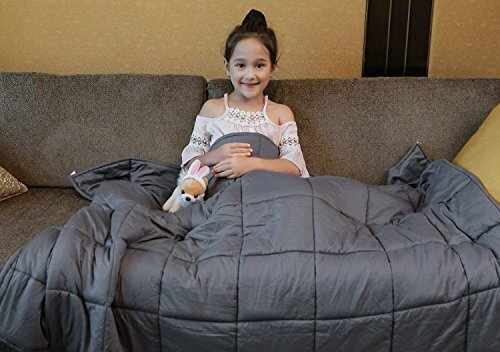 And this is where a weighted blanket for your child may help (such as this highly rated one in the US or this UK one). Let’s take a look at look at how weighted blankets work and uncover some of the best weighted blankets for children currently available. A weighted blanket is a blanket that is heavier than a regular, everyday blanket. Typically, the blanket contains plastic poly pellets of tiny glass beads, which are sewn into and evenly distributed across the blanket. This gives the blanket the extra weight. Many parents have found weighted blankets of huge benefit for kids who suffer from anxiety or sleeping issues. Parents also report that many kids specifically with autism, ADHD and sensory processing disorders have benefited from the use of a weighted blanket, helping to both soothe anxiety and restlessness and improve sleep. A weighted blanket applies gentle pressure, or deep touch stimulation (DTP), on the user, which stimulates the brain to release neurotransmitters such as serotonin and dopamine. Along with melatonin, these hormones induce a soothing effect on the body, helping to calm the nervous system and encourage restful sleep. Here are some general tips to help you choose a weighted blanket for a child. Choose a material that suits your child – fleece and minky blankets are warm, cosy and tactile, whilst 100% cotton blankets are more breathable and retain less heat. Cotton blankets may better suit children better who get hot easily or prefer to sleep at a certain temperature. Get the right size and weight – occupational therapists generally advise that weighted blankets for children should typically be 10% of a child’s body weight, plus 1 or 2 pounds. If unsure, always consult a healthcare professional who can help guide you based on your child’s own unique needs. Never use a weighted blanket with a baby – the positive reports about weighted blankets have, unsurprisingly, led many to parents ask if weighted blankets are suitable for babies. The answer is NO. Babies can’t move their bodies or regulate their breathing and temperature in the same way as older children and adults, so a weighted blanket may pose overheating or suffocation risks. It’s also advised you don’t use a weighted blanket if you are pregnant. You can find a list of more detailed weighted blanket guidelines here. With the popularity of weighted blankets growing, it’s not hard to find a range of options online. However, not all weighted blankets are necessarily made the same, so here are 4 of the best weighted blankets for children I’ve personally come across. Blanket Overview: The Harkla weighted blanket for kids is a popular and highly rated blanket. It’s extremely soft to the touch and it’s Minky Dotted fabric makes it a great choice for sensory kids. It’s a 2-piece design, so unlike some weighted blankets, which require dry cleaning, you can easily remove and wash the cover. The blanket comes in 3 colour options and 2 child-friendly weight options – 5lb and 7lb. There’s also a Lifetime Money Back Guarantee if you’re not happy with the blanket, which is great to know if for some reason your child doesn’t take well to the blanket. Any Cons: Largely 5* reviews, but a few reports of filling shifting to edges/corners. YnM weighted blankets for kids are another best seller. However, keep in mind you have to buy a removable cover separately (recommended but not essential). The weighted blanket inserts themselves are dry clean only, but the covers are washable and available in cotton, soft minky or bamboo (not all cover fabrics are available for all blanket insert sizes, so check product details carefully). Discounts are usually available if you buy a weighted blanket insert and cover together. All YnM weighted blankets have a 7 layer design, which is claimed distributes the weight more evenly and aids better temperature control. Filling consists of tiny glass beads surrounded by light fibrefill. Any Cons: Largely positive reviews, but a number of reports of seams coming undone, causing bead leakage. Also some reports of covers not fitting blanket inserts that well. Blanket Overview: Mosaic Weighted Blankets offer an incredible choice of weighted blankets and they’ll even make you your very own custom blanket if you want one! All blankets are handmade, with cotton or minky fabric covers and filled with plastic poly pellets and a small amount of polyfill. Covers are not removable, but the blankets are washable up to a recommended weight of 12lb (a commercial washer is recommended for blankets over 12lbs). Dedicated kid’s blankets come in small, medium and large and there’s a wide choice of colours and fun patterns for both girls and boys. Blanket Overview: Many of the leading weighted blanket suppliers are US based, so if you live in the UK, you’ll be pleased to know that Senso Rex is too! Senso Rex produce a lovely range of weighted blankets specifically for children and if your child is heat sensitive, the blankets are made with 100% breathable cotton covers, rather than the warmer Minky fleece versions. 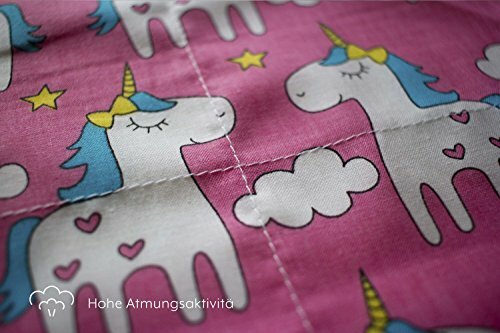 The covers come in a range of fun styles – from unicorns to dinosaurs – and the filling is formed of tiny glass beads. Blankets range from around 4.4 lbs up to 13.2 lbs and they get great reviews from parents. Here are some commonly asked questions regarding weighted blankets for children. Most commonly, you’ll see weighted blankets promoted as an aid for children (and adults) with sleep and anxiety issues, as well as symptoms linked with disorders such as autism and ADHD. People have also reported that weighted blankets have helped children with Downs Syndrome, restless leg syndrome and dental anxiety, as well as adults with dementia, brain trauma, Fibromyalgia and OCD. A recent study identified a rise in anxiety among children & teens in the US. Stress and anxiety cause cortisol to increase in the body, which over time, can lead to a range of symptoms, including muscle tension, headaches and problems relaxing. This is where a weighted blanket may help, since the gentle stimulation of the blanket can help to reduce cortisol and encourage the brain to release serotonin, which is a natural mood enhancer. Many sleeping disorders in children (as well as adults) are thought to be linked with low serotonin & melatonin levels. The gentle stimulation of a weighted blanket can help the brain to produce serotonin, which naturally converts to the ‘sleep’ hormone melatonin. This 2015 study found that a weighted blanket did, indeed, help participants with insomnia sleep better. Many children with autism, ADHD and sensory processing disorders suffer from anxiety and sleeping issues. Children with autism are also often found to be low in serotonin and melatonin. The gentle touch stimulation of a weighted blanket may support a child’s body in naturally releasing these chemicals, leading to reduced stress symptoms and improved sleep. What’s The Science On Weighted Blankets? Whilst there are many reports from happy parents (and adults) on the benefits of weighted blankets, scientific data and research is quite limited – but some does exist. Some of the earliest research on DTP and weighted blankets was produced by Temple Grandin. On the autistic spectrum herself, Temple developed the ‘squeeze’ or ‘hug box‘, a device which applied deep touch pressure on its users. The box was found to benefit children with autism and ADHD. This was backed up from this study, which found that weighted blankets had a ‘positive impact on sleep. You can read more weighted blanket studies here. Are There Weighted Blankets Guidelines? Whilst there are no ‘official’ weighted blanket guidelines, these 11 tips offer some generally accepted guidelines to follow when buying, or using, a weighted blanket. This is a common question, as people often associate ‘weight’ with ‘hot’ – but this isn’t necessarily the case. It’s more to do with the material the blanket is made from. For example, weighted blankets with 100% cotton covers are more breathable than blankets made from man-made fibres such as fleece or minky, which tend to retain more heat. For more information, see this article on whether weighted blankets are hot. Weighted blankets should never be used with a baby. Babies can’t move their bodies or regulate their internal temperatures in the same way as older children, so blankets could pose a suffocation or over heating risk. Mosaic Weighted Blankets suggest weighted blankets should generally be fine for toddlers aged around 2 or 3, but others suggest waiting until 6 or 7. If unsure, or your child has a condition where they overheat, or may be unable to remove the blanket unaided, consult a healthcare professional for advice. We’re all individuals, with our own unique needs and biological systems, after all. Whilst many children with autism, for example, have reported benefiting hugely from a weighted blanket, others simply find the extra weight and stimulation too much. I know an autistic child who didn’t get on with a weighted blanket at all, but I also know of many more who did. At the end of the day it comes down the individual. Weighted blankets also generally aren’t cheap, so if you’re concerned about cost, you could always try making your own. Alternatively, ask a manufacturer direct if they’d be willing to provide a refund should the blanket not quite work out for your child. More and more parents are discovering the many benefits of weighted blankets for kids and teens. symptoms linked with ADHD and ADD. 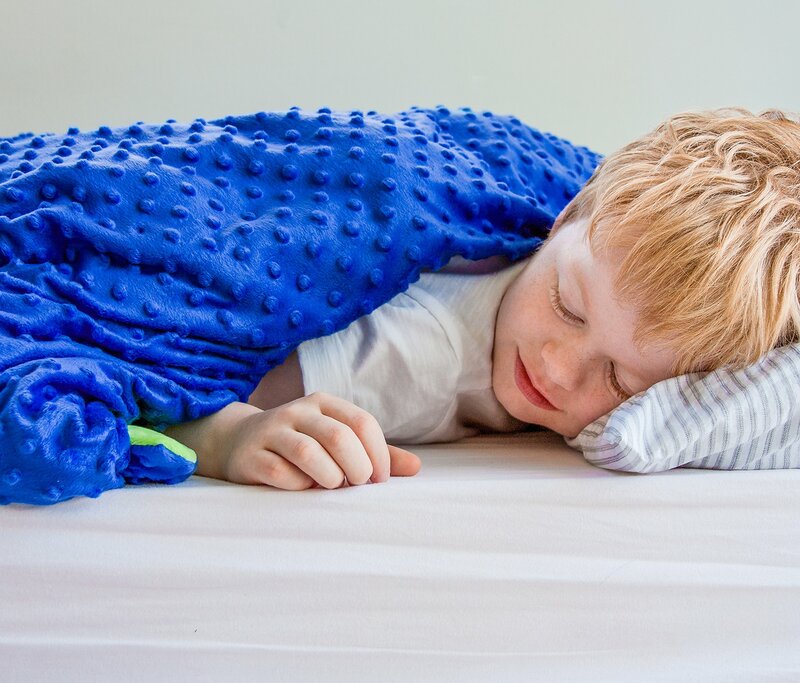 So if you have a child who has trouble sleeping or suffers from anxiety or symptoms associated with autism or ADHD, a weighted blanket could well be worth a try. Note: It’s advised you consult a healthcare professional for advice before choosing a weighted blanket for your child. Never use a weighted blanket with a baby or child who has difficulty moving unaided, or regulating their temperature. Also don’t use a weighted blankets when pregnant.